Green Reading: "Greenest government ever"? Never! David Cameron has reneged on a pre-election promise to reward early adopters of solar panels and other domestic green energy generation. 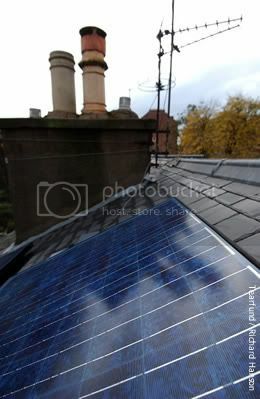 Under the "feed-in tariff" scheme introduced in April, owners of solar panels fitted to houses after 15 July 2009 are paid 41.3p per unit of electricity, while householders who put up panels before that date get just 9p. Green energy campaigners have fought the difference, which is a betrayal. Responding in March to a letter from one of his Witney constituents calling for an increase in payments to such "pioneers", Cameron wrote in a letter seen by the Guardian: "I agree with you that the [Labour] government's current proposals for feed-in-tariffs will unfairly penalise the very people who were the early investors in local energy." He added: "That is why under a Conservative government, any micro-generation technologies that have already been installed … will be eligible for the new higher tariffs once they commence." But last month, responding to a question from Green MP Caroline Lucas the energy secretary, Chris Huhne, ruled out any such move. "I considered the issue carefully on a value-for-money basis, and I am afraid that the advice from my officials was clearly that we cannot introduce retrospection in such cases because it does not represent value for money". "We are trying to introduce new schemes in future, and therefore, sadly, the only incentive and payback that people such as the Hon Lady and I will get is the warm glow of being pioneers." Within days of taking power as PM, Cameron said the coalition would be the "greenest government ever". Sigh. reminds me of Tony Blair who made many fine speeches, but never delivered. A few years ago Cameron referred to wind farms as “giant bird-blenders”!